What Good are Style Indexes? As Andy Rooney might say "Ever wonder about style indexes? Where they come from? Who uses them?" We pretty much take style indexes for granted today, and generally don't really care much which ones we use as long as the name fits the mandate — large value, small growth, and the like. Tailoring the benchmark to the manager's style is a giant step forward, away from the one-size-fits-all mistakes that have characterized the investment industry for 3 decades, but we need to be careful if we want to actually solve the performance evaluation problem in the process. To wit, most managers appear to be a blend of styles. Not all growth managers are the same - some are smaller company oriented, some routinely hold value companies, etc. The same uniqueness is true of value managers. We know this from a relatively new technology called returns-based style analysis (RBSA). RBSA uses sophisticated regressions to find the blend of style indexes that behaves most like the manager's actual performance. For most managers this "blend" includes more than one style index, which means that if we use just one off-the-shelf style benchmark we'll still be evaluating style rather than skill. Not much is gained relative to the one-size-fits-all mistake since most of the manager's performance differential will continue to be due to misspecification of the benchmark if that benchmark is a single off-the-shelf style index. Reasonable results — Style profiles conform to intuition. Limited spurious loadings — There is a statistical problem called "multicollinearity" that exists when stocks are in more than one style index. The regression gets "confused" by this multiple membership. It's not pretty. About 10 years ago, when style indexes were still in their infancy, no one family of indexes stood out as excelling in these criteria. 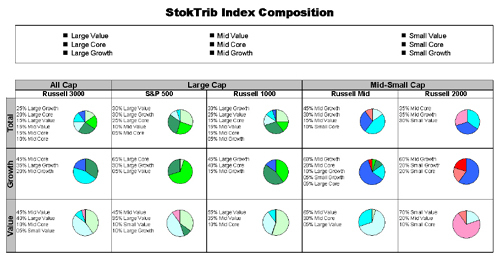 As an investment consultant at the time, I started thinking about this situation, and decided to develop my own set of indexes that would work well as building blocks for blended style benchmarks. My primary objective was to break the stock market into meaningful segments, rather than to create stand-alone investment performance bogeys. The rules for constructing these Surz style indexes are provided in the Appendix to this article. You can follow these rules yourself and replicate the indexes - no proprietary secrets here - or you can download them for free from www.ppca-inc.com/benchmark.htm. Mutually exclusive — No stock gets into more than one style. Accordingly, muticollinearity is minimized. Exhaustive — All stocks are classified. Some index vendors throw out data, for example stocks with negative earnings, or small companies. You can't find a good fit if the stocks you own have been eliminated. Includes Core — This continues to be a novel idea, although others have discussed it on occasion; it's a way to deal with stocks in that gray area between value and growth without violating the mutually exclusive rule. Interestingly, core doesn't always perform between value and growth. Sometimes it's better, and sometimes it's worse, than both. You'll never know when this interesting phenomenon occurs with any of the popular index families. Rebalanced quarterly — Things change rapidly. Calling a cheap high tech stock "growth" because it had a high P/E a year ago doesn't make sense. Because they follow these rules, my indexes work well when blended into customized benchmarks for evaluating manager performance. Surz indexes make an excellent style palette to use in RBSA. This chart provides an interesting characterization and contrast of the more popular style indexes. Before style indexes even existed there was wide acceptance & support for normal portfolio benchmarks. The report on AIMR's website regarding benchmarks speaks highly of the idea. Problem is good normals are hard to come by. Only a couple of consulting firms are any good at it, and they charge high fees for their expertise. Anyway, almost everyone would agree that a custom portfolio is a better benchmark than an off-the-shelf version, but only a few have such custom portfolio benchmarks. Today normals are sometimes called "designer benchmarks." Enter the style indexes. I suppose these were introduced as a compromise to designer benchmarks. These style indexes are indeed better than broad market indexes, but they still leave most of the problem unsolved. The evidence shows that most managers are more fairly benchmarked against their style than against a broad index, but it also shows that style-related factors still account for most of the differences between a specific manager's return and that of the selected style benchmark. Evidence also shows that there are significant differences among style benchmarks of different vendors. 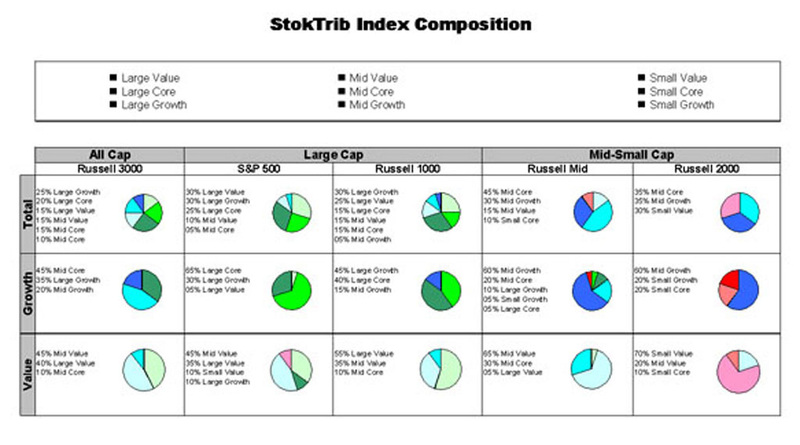 It's common to win against a Russell index and lose against a comparable Wilshire index, for example. Back to the normal portfolio, which is still a pretty good idea even though it's not in use much. Designer benchmarks really are better than off-the-shelf indexes, including style indexes. Finding the right mix of stocks with the right weights is what makes the normals so hard to construct. It requires some really sophisticated black boxes. But what if most of a manager's essence could be captured with building blocks that are bigger than individual stocks? Instead of building the normal with tiny jigsaw pieces in the dark could we come close with combinations of round pegs and square pegs, put in the appropriate holes, all done in the light of day? The answer is yes, if you use the right pegs. The characteristics of these pegs are: Mutually Exclusive, Exhaustive, and Frequently Rebalanced. Having a Core classification helps too, so you have pegs for those oblong holes. Yes, Virginia you can build a poor man's normal. You just need the right regression analysis and the best regressors, or family of style indexes. Otherwise you've still got the same old problem of evaluating style rather than skill. It would be great if someday there could be a standardization of style indexes. Then we could use a common scheme to characterize and evaluate active investment portfolios as alternatives to passive style blends. It seems to me that such a standard should have features similar to those described above.